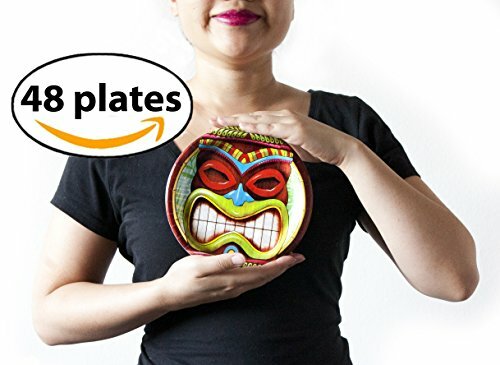 Hawaiian Tiki Small Party Plates, 48 Count. for Tropical and Beach Themed Parties. by Hit Delights at WP Ultimate Social. Hurry! Limited time offer. Offer valid only while supplies last. ALOHA! THROW THE HAWAIIAN PARTY OF THE YEAR WITH THESE ADORABLE TROPICAL TIKI THEMED PARTY PLATES! These colorful little plates are sure to shine and make this a very special and memorable party for everyone! Very popular at tropical beach and luau parties. These plates will get you a lot of compliments! GREAT PACK SIZE FOR MEDIUM OR SMALL PARTIES WITH 48 PLATES. Purchase more than 1 pack for a large party! MINI PARTY PLATES ARE GOOD FOR SNACKING KIDS OR SERVING DESSERTS. They're small, 6 inches in diameter and are not expected to hold a lot of food. Great for appetizers. Please order larger sized plates if you are looking for entree plates though. STURDY, PREMIUM STRENGTH PAPER PLATES means they will hold up during your entire party with no drips, leaks, and tears. Serve saucy and wet foods with complete confidence... These plates are built to survive! MADE IN THE USA with high quality! If you have any questions about this product by Hit Delights, contact us by completing and submitting the form below. If you are looking for a specif part number, please include it with your message.